Not one particularly enjoys feeling a sense of estrangement, but some people handle this differently than others. There are some who can overcome these feelings and move on with their lives, while others might hold onto this for a while. 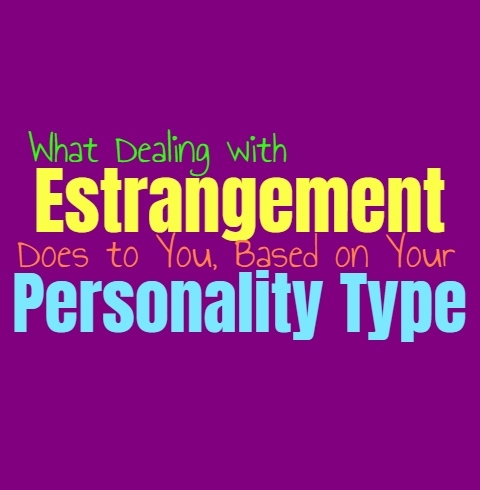 Here is how you deal with estrangement, based on your personality type. INFJs definitely feel a sense of loss when they become estranged from someone, especially if they cared for that person deeply. This isn’t something they simply let go of and can move on without continuously feeling a sense of loss and regret. INFJs are capable of shutting people out of their lives if it is the right choice for them, but that doesn’t mean it doesn’t continue to hurt them. When the INFJ loves someone it is forever, it isn’t something that they can simply erase from their hearts. They will feel this sense of estrangement throughout their lives, but over time it will grow into something much less painful, and even become bittersweet. ENFJs care about their relationships and want to be able to maintain them no matter what. When they do feel a sense of estrangement it can weigh heavily on their hearts. When the ENFJ cares for someone they don’t like feeling like they have to let go or move on from this connection. They are capable of closing the door on someone if it is the right choice, but that doesn’t mean they don’t still feel a sense of sadness because of this. When the ENFJ becomes estranged from someone they love, it is a loss they continue to feel, and will hold onto more than people around them know. INFPs certainly experience the loss from becoming estranged from others, especially someone they care deeply for. INFPs don’t need to constantly be around someone in order to feel close to them, but they definitely notice when they become sincerely estranged from someone. When this happens the INFP can certainly blame themselves, or question why they have become so distanced from this person. They will hold onto their relationship in some ways, still feeling close the memories they shared together. ENFPs can often overcome estrangement, since they want to have people in their lives who are willing to keep them around. If they feel like they are become distanced from someone they don’t like allowing this to upset them or hold them back. ENFPs want to be able to make connections with people who actually want to feel close to them, and so they try not to become too hung up on the past. Of course the ENFP will become hurt when the estrangement starts to occur, but after awhile they are capable of overcoming this. INTJs can often overcome feeling estranged from someone, since they don’t like trying to force relationships. If they cannot seem to maintain that connection then they will likely feel it is for the best. This doesn’t mean they don’t become hurt or upset when they are estranged from someone they once cared for, but they simply don’t see any logic in holding onto this. INTJs believe in moving on and want to make connections which will last. They are willing to wait for people who can put forth the effort in order to make their relationship something strong and lasting. ENTJs can become upset when they feel estranged from certain people, especially if they have made a commitment to that individual. When it comes to family the ENTJ does not want to feel a sense of estrangement, and this can certainly be hurtful for them. They are capable of moving on and won’t allow this to hold them back or cripple them, but that doesn’t mean it won’t bother them from time to time. ENTJs want to have people who are willing to maintain their connection, and so they will focus more on those relationships than the ones they have become estranged from. INTPs do become nostalgic sometimes, and so they often remember relationships from the past which they have become estranged from. For the INTP this can be a bittersweet memory, recalling what they had and how that is long past. It can be difficult for them with certain people, especially when they felt a deep and meaningful connection with them. Sometimes the INTP will go back to these relationships, wondering what went wrong and how things could have been different. For the most part they try to move forward, even though in their minds they do go back to things. ENTPs definitely become hurt when they feel a sense of estrangement from people they once cared deeply for. This isn’t something they will express outwardly and for most people it seems like the ENTP moves on just fine. When they make a sincere connection with someone it can be hard for them to completely let this go, and they will likely feel a twinge of sadness whenever they recall this old relationship or friendship. ENTPs do their best to keep moving forward and don’t want people to recognize when they have been hurt by someone else. Once the ISTJ becomes committed to someone it can become deeply challenging for them to let go of this. When they feel a sense of estrangement from someone they were once very close to, it certainly affects them more than people realize. ISTJs don’t like letting go or giving up on their relationships, and so this often feels like a failure to them. Having to move on from someone they were once connected to, is difficult and often leaves them feeling a sense of regret even if they know it was the right thing to do. ESTJs don’t like moving on from connections which were once truly important to them, since they deeply value their commitments. Experiencing estrangement from someone the ESTJ loves is definitely going to upset them, and leave them feeling like they have failed in some ways. They don’t want to simply move on and let go of their relationships, and want to do their best to make these things work. If they become completely estranged from someone the ESTJ does their best to move on, but it is still difficult for them. ISFJs become deeply upset when they are estranged from someone they care for, and often have a hard time letting go of this. They want to be able to make their relationships work and really do whatever they can to mend what has been damaged. When they experience an estranged feeling from someone they love, the ISFJ definitely takes this very harshly. They likely blame themselves, trying to figure out what they could have done to make this situation better and might feel as if they have failed in some ways. ESFJs definitely become saddened when they experience a sense of estrangement from someone they once loved. For the ESFJ these feelings can be something they hold onto for a long time, especially if they truly cared for this person. They might take this as a failure on themselves, wondering how they could have done better to make the relationship work and not allow things to become so strained and distant. ISTPs try their best to move forward in life and often realize that not every connection is meant to last. They certainly don’t enjoy becoming estranged from someone they once loved, but they won’t try to dwell on this. ISTPs don’t look to the past as much as they do the present, and prefer to focus on living in the moment. They want to maintain the connections they currently have, instead of obsessing over things they have lost and people who they feel estranged from. ESTPs do have moments where they reminisce over old connections and people they once cared for. They become saddened by those they have become estranged from, but are capable of moving on regardless. They don’t like obsessing over the past and want to find ways to continue to grow the connections they currently have. ESTPs can certainly move on from things and do their best to avoid dwelling on things that they can no longer change. ISFPs don’t like feeling estranged from people they make truly deep connections with, since this isn’t something that happens often. While ISFPs are caring people who do make a lot of friendships, they rarely feel sincerely bonded to someone and so they don’t want to let go of these types of connections. When they sincerely care for someone the ISFP can become a bit lost if they lose this, and so for them estrangement can be a very upsetting thing. ESFPs do care about their relationships and when they love someone they want to feel close to that person forever. When it comes to their family and the people they truly let in, the ESFP doesn’t want to feel distant or estranged from them. Whether this be their spouse, siblings or children, the ESFP wants to maintain these relationships and can become a bit lost if they feel estranged from them. They will continue to put on a happy face and try to move forward, but they never truly let go of certain people.